The video replay highlights of Omar Andres Narvaez vs David Carmona Fight for December 21, 2013. 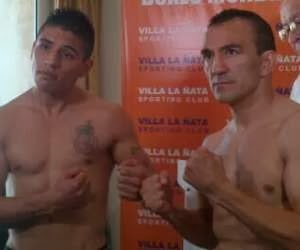 We are going to revealed today's sports of boxing between Omar Andres Narvaez vs David Carmona which is a fight to remember for WBO super flyweight title held on December 21, 2013, Saturday night at Villa La Ñata Sporting Club, Buenos Aires, Argentina. If you could see the video replay highlights of Narvaez vs Carmona, it was such an exciting fight where Omar Andres Narvaez at 38 defeated Carmona via 7th round TKO which many thought Narvaez can't do that. Watch the video replay highlights of Narvaez vs Carmona fight. Narvaez captures the WBO super flyweight title on his waist. Congratulations to Narvaez! He is still an elite boxer and can still crack for another title. Omar Narvaez is getting on in years and we just saw Chris John upset by someone you wouldn't have thought could do it even two years ago. Some of Narvaez's recent unheralded challengers have also given him closer than expected. Here's the round by round analysis of the fight of Narvaez vs Carmona Fight: Narvaez is ducking in under Carmona's jab. Narvaez is sending his guard on elevator rides from basement to penthouse, catching the left hook of Carmona on his right arm with a fortuitously timed move. Narvaez springs forward with a quick right hook, blocked. Carmona goes down. Ruled a slip. The canvas is still wet. Left hand leads speared into the body from outside by Narvaez. Carmona is dancing around, moving left, widening his stance to anticipate Narvaez's jumps inside. Right hook up high on the head by Narvaez. Carmona stumbles and nearly falls, again on the slick canvas. Narvaez is rushing inside, making Carmona give ground, leading with high right jabs and then switching up with right hooks on the body. Carmona extends his left jab and takes light steps to his left, spinning away from the ropes. Cuffing right hook behind the left ear by Narvaez and Carmona wobbles into him, tying up to steady himself. Another quick attack by Narvaez and Carmona goes down, but the referee declares it a slip. Narvaez is ducking forward past the jab of Carmona, letting it skid off the front of his now close-shaved mullet, dropping in right hooks on the face as he straightens up and following with piercing straight lefts on the body or face. Carmona is hurt and backs away. Narvaez follows with right upper-hooks on the chest, attacking from low angles and chasing Carmona from one set of ropes to the next. Narvaez is stalking Carmona, pressuring with the right jab and staying low, then exploding with right hooks and straight lefts in rapid succession. Carmona is pinned in a corner and steps out laterally, tossing jabs and wide looping right hands to cover his escape. Narvaez presses in and Carmona dives atop him, swallowing the champion into a clinch. Narvaez wrestles free and sticks the right jab up into Carmona's face, chasing him to the ropes. Carmona ducks and slips away from Narvaez, moving right. Narvaez weaves in past Carmona's jab and lands a 1-2 on the face. Carmona is backed into a corner and Narvaez opens up with body punches and left uppercuts on the face. Carmona is sitting on the middle rope, unable to get clear. The crowd smells blood in the water and eggs Narvaez on for the finish, but the clock runs out. Stiff right jab by Narvaez. Carmona is backing up, pawing out his left jab and then waving hooks off it without retracting. Narvaez is hustling in, letting the outstretched left fist of Carmona careen off his upper cranium while pecking at Carmona with his much harder right jab and whipping left hands over the top. Carmona's knees buckle as he is knocked into the ropes. Another lightning quick explosion by Narvaez, landing power punches leaping forward off his toes, and Carmona dips, gloves clutching a rope for support. Again not ruled a knockdown. Narvaez is swooping in and thrusting his right jab hard and fast into Carmona's nose. Carmona is cleaving to the ropes, letting his back scrape along them as he pushes a defensive jab. Narvaez is doubling the right hook to chest and face and follows a pair with a hard left on the lungs and Carmona finally goes down sucking wind and is finally ruled as officially knocked down! Carmona gets up and hugs the ropes, pawing jabs in Narvaez's way and curling up as Narvaez cannonballs into him with quick sharp combination punches. In round 7, the towel has been thrown and it was Narvaez who is the victor via 7th round TKO over Carmona. Here's the video replay highlights of Omar Andres Narvaez vs David Carmona fight. I hope you enjoy watching the video replay highlights of Omar Andres Narvaez vs David Carmona for WBO super flyweight title. Thanks for watching and till our next installment of the sports of boxing event only right here at Pinoythinking.com!